"Mashburn" redirects here. For other people with the surname, see Mashburn (surname). Jamal Mashburn (born November 29, 1972) is a retired American professional basketball player. Nicknamed the "Monster Mash," Mashburn was a prolific scorer as a small forward in his 12 seasons in the league, with a career scoring average of 19.1 points per game. Mashburn was born to Bobby, a former heavyweight boxer, and Helen Masbhurn. His father retired in 1974 and then lived separately from Helen and his son Jamal, divorcing after about 10 years. 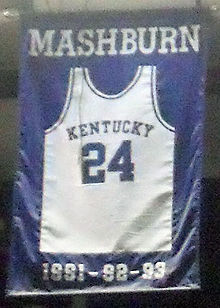 After attending Cardinal Hayes High School in The Bronx, Mashburn had a very successful basketball career in college, playing for the University of Kentucky. He was the fourth-leading career scorer for the Wildcats and a consensus First Team All-American by his junior year, in which the Wildcats made it to the Final Four of the NCAA Tournament. Following the tournament he declared for the 1993 NBA draft, with Mashburn being selected by the Dallas Mavericks with the fourth pick. The Mavericks were a lottery team led by veteran point guard Derek Harper and second year guard Jim Jackson, and Mashburn quickly shared the reins of the offense, averaging 19.2 points a game in 73 starts and earning a selection to the first NBA All-Rookie Team. Despite this the Mavericks could only manage 13 wins for the 1993–94 season. In the off-season, the team drafted star point guard Jason Kidd, teaming up with Jackson and Mashburn to become known collectively as "The Three J's." The Mavericks would improve to 36 wins in the 1994–95 season, as Mashburn averaged 24.1 points a game (sixth in the league), while placing fifth in the league in free throw makes (447), seventh in made field goals (683), and fifth in total points (1,926). The season also featured a 50-point performance for Mashburn on November 12 against the Chicago Bulls in Chicago. This made him the fourth-youngest player to score 50 points in an NBA game (Brandon Jennings is the youngest). He also broke many franchise records and blossomed into one of the best scoring forwards in the league. Despite the team's improvement they were unable to make the playoffs, and injuries would force Mashburn to only play 18 games in the 1995–96 season. Mashburn started in just 21 games of the Mavericks' first 37 games of the 1996–97 season, and on February 14, 1997, he was traded to the Miami Heat for three players. Miami was a loaded team led by all-stars Alonzo Mourning and Tim Hardaway and coached by Pat Riley. The addition of Mashburn boosted the team's offense, and the team finished the season with a franchise best 61 games with Mashburn averaging 13.4 points in 30 starts. In the playoffs the Heat defeated the Orlando Magic in a difficult 5 games in the first round, followed by a grueling seven game series win against the New York Knicks. Miami made its first ever Conference Finals against the defending champion Bulls, and would lose the first three games of the series before managing a win in Miami in game four, with Mashburn scoring 17 points. The Bulls proved too much for the Heat and won the series in the fifth game in Chicago. Mashburn averaged 10.5 points in his first postseason. Injuries limited Mashburn to 48 games in the 1997–98 season, but he started in each game he played and averaged 15.1 points a game as Miami won 55 games before losing in a five-game first round series to the Knicks. Mashburn started in 3 of the games and saw his production slip. The following season would be shortened to 50 games due to a league lockout, and injuries again limited Mashburn to just 23 starts with averages of 14.8 points a game with 6.1 rebounds a game. Miami captured the best record in the Eastern Conference, but once again lost in the first round to New York, as Mashburn averaged 10 points in the five game series. The 1999–2000 season featured an improvement statistically for Mashburn, as he shouldered more of the offensive load and averaged 17.5 points a game including a career high 112 three point field goals. The Heat won 52 games before sweeping the Detroit Pistons in the first round of the playoffs in three games. This set up another rematch with New York, as the Heat and Knicks battled in another grueling seven game series. Despite scoring in bunches in the Heat's victories, including a 21-point performance in game 5, Mashburn's scoring dropped off in the final two games of the series, and the Knicks once again eliminated Miami at home. Following another disappointing playoff run for the team, Mashburn and teammate P. J. Brown were traded to the Charlotte Hornets for Eddie Jones and Anthony Mason. In his first season in Charlotte, Mashburn averaged 20.1 points, 7.6 rebounds and 5.4 assists in 76 games. Led by his play and the play of Baron Davis, the Hornets won 46 games and faced Miami in the first round of the playoffs. While his former team was favored to win the series, Mashburn averaged 23.7 points, as the younger Hornets shocked the Heat and swept them in three games. Next up were the Milwaukee Bucks, who took a two-game lead before the Hornets won game three in Charlotte led by Mashburn's 36 points and game four, in which Mashburn scored 31. Despite managing to win three straight games, the Bucks responded to win the last two games and the series. Mashburn averaged a career high 24.9 points in the 2001 playoffs. The 2001–02 season once again featured injury problems for Mashburn, and he only played in 40 games averaging 21.5 points per game. The Hornets made the playoffs and defeated Orlando before losing to the New Jersey Nets, but Mashburn's injury woes kept him out of the postseason. The Hornets would go on to relocate to New Orleans after the season ended. Mashburn's best overall NBA season took place in the 2002–03 season, and he played in all 82 games averaging 21.6 points per game. He played in his first and only All-Star game, scoring 10 points in the 2003 NBA All-Star Game in Atlanta, won the Eastern Conference Player of the Month award in March and made the All-NBA Third Team. The season also featured some high scoring games for Mashburn, including a 50-point performance against Memphis on February 21 and a 40-point game against Orlando on March 26. The Hornets won 47 games and faced the Philadelphia 76ers in the first round of the playoffs, but Mashburn played in only four games of the series which went to six games. Mashburn continued his stellar play in the 2003–04 season, but injuries plagued him for most of the year and he managed to play in only 19 games. He was later unable to participate in the 2004 NBA Playoffs. Bothered by problems with his right knee (patella femoral irritation), he decided to sit out the 2004–05 season in hopes that his knee would recover. He had microfracture surgery performed on his knee, a risky surgery that not all players have been able to recover from. Despite his decision to sit out the year due to his knee, the Hornets still traded Mashburn, along with Rodney Rogers, to the Philadelphia 76ers in exchange for forward Glenn Robinson on February 24, 2005. Mashburn was never able to recover from his chronic knee problems and never saw court time for Philadelphia. He was on the injured list for all of the 2004–05 season and the inactive list for 2005–06. On March 24, 2006, the 76ers waived Mashburn, who subsequently announced his retirement from the NBA. He had career averages of 19.1 points, 5.4 rebounds and 4.0 assists per game. Mashburn, who averaged 20.8 points per game in 2003–04, is one of only six players since 1970 to have averaged at least 20 points per game in his final NBA season. The other five are Jerry West (20.3 in 1973–74), Larry Bird (20.2 in 1991–92), Dražen Petrović (22.3 in 1992–93), Reggie Lewis (20.8 in 1992–93), and Michael Jordan (20.0 in 2002–03). Since retiring from basketball, Mashburn has worked for ESPN as an analyst and launched a number of successful business ventures. As of 2018, he owned over 90 businesses, including 34 Outback Steakhouse franchises, 37 Papa John's franchises, and a number of car dealerships across the state of Kentucky. Mashburn is a partner in Ol Memorial Stable, along with former Kentucky coach Rick Pitino and Outback Steakhouse co-founder Chris T. Sullivan, which owns Kentucky Derby prospect Buffalo Man. Since his retirement Mashburn lived in Miami. In 2017, he and his wife divorced after a 17-year marriage. Their son, Jamal Jr., attended the Gulliver Prep before transferring to Brewster Academy. He was ranked as the 75th best player overall in the Class of 2020. ^ Rhoden, William C. (December 27, 1992). "COLLEGE BASKETBALL; Mashburn Goes Searching for Himself". The New York Times. Archived from the original on January 15, 2018. Retrieved March 14, 2019. ^ D'Angelo, Tom (December 7, 1997). "Fighting for lost time". Newspapers.com. The Palm Beach Post. p. 48. Retrieved March 14, 2019. ^ Forde, Pat (January 11, 1992). "Contradictions have meshed to make Mashburn". Newspapers.com. The Courier-Journal. p. 13. Retrieved March 14, 2019. ^ Staple, Arthur (June 11, 1993). "Mashburn looks like million bucks in homecoming". Newspapers.com. Daily News. p. 91. Retrieved March 14, 2019. ^ Isaacson, Melissa (November 13, 1994). "Mavs Top Bulls In Ot As Mashburn Scores 50, Jackson 38". chicagotribune.com. Archived from the original on November 7, 2017. Retrieved March 14, 2019. ^ Brown, Clifton (February 15, 1997). "Miami Acquires Mashburn From Dallas to Bolster Its Firepower". The New York Times. Archived from the original on June 15, 2018. Retrieved March 14, 2019. ^ Winderman, Ira (February 15, 1997). "Mashburn turns up the Heat". Sun-Sentinel.com. Archived from the original on March 14, 2019. Retrieved March 14, 2019. ^ Armour, Terry (May 28, 1997). "Jackson: More Rodman Sanctions Unlikely". chicagotribune.com. Archived from the original on March 4, 2016. Retrieved March 14, 2019. ^ Kerby, Trey (September 30, 2010). "Jamal Mashburn is a pizza-making, onion-frying entrepreneur". Yahoo Sports. Archived from the original on March 14, 2019. Retrieved March 14, 2019. ^ Richardson, Shandel (July 3, 2018). "Former Heat forward Jamal Mashburn becomes successful businessman in post-NBA life". Sun-Sentinel.com. Archived from the original on August 8, 2018. Retrieved March 14, 2019. ^ "EXCLUSIVE: Ex-NBA Star Jamal Mashburn & Wife Officially Divorce After 17 Year Marriage". theJasmineBRAND. December 19, 2017. Retrieved March 14, 2019. ^ Roberts, Ben (April 27, 2018). "Jamal Mashburn's son is a highly touted recruit, and he's hoping to hear from Kentucky". kentucky.com. Archived from the original on July 31, 2018. Retrieved March 14, 2019. ^ Villa, Walter (November 30, 2017). "Gulliver Prep star point guard Jamal Mashburn Jr. has dreams beyond basketball". USA TODAY High School Sports. Archived from the original on May 8, 2018. Retrieved March 14, 2019. ^ Hale, Jon (May 8, 2018). "Jamal Mashburn hopes son will carve his own reputation". USA TODAY High School Sports. Archived from the original on May 15, 2018. Retrieved March 14, 2019. ^ Hall, Brendan C. (July 2, 2018). "Class of 2020 legacy Jamal Mashburn Jr. transferring to Brewster Academy". USA TODAY High School Sports. Archived from the original on March 14, 2019. Retrieved March 14, 2019. ^ "Jamal Mashburn Jr., Brewster Academy , Shooting Guard". 247Sports. Retrieved March 14, 2019. This page was last edited on 22 April 2019, at 08:23 (UTC).